Let’s face it, kids often have a limited view of career possibilities. Policeman, doctor, nurse, teacher, fireman, ballet dancer, and the old standby, the postman. The people they encounter every day that they can actually identify what they’re doing. They’re not considering human resources representative, marketing executive or astrophysicist. This cheery costume is perfect for the idealized child of yore who just longs to live out their days as civil servant, collecting a pension, and attracting neighborhood dogs. Treats and/or mace to bribe and/or punish said dogs not included. If your child begins to exhibit signs of stress, paranoia, acrimony with their “co-workers,” or uncontrollable rage at being passed over for that cushy Main Street route, gently attempt to pry them away from their beloved mail bag and uniform and implement a program of relaxation and self-esteem. 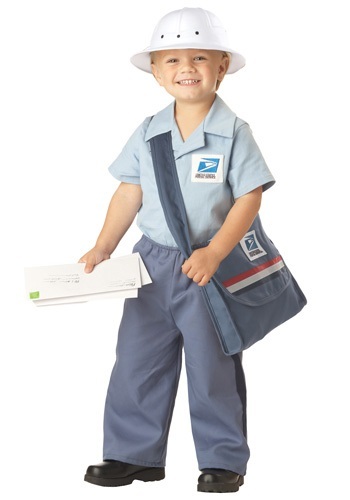 This Toddler Postman Uniform is an officially-licensed replica of an actual U.S. Postal Service uniform. Its elastic waist is sure to stay snug as your tyke walks off that baby weight, and the steel blue mail bag will fit every correspondence your child is entrusted with. (Note: HalloweenCostumes.com does not recommend giving a toddler sole or any responsibility over delivering bills. You’ve been warned.) The molded white polyfoam hat resembles a pith helmet, for your little letter carrier who takes their “neither heat nor gloom of night” credo a little too seriously––it’s okay, the Dark Continent is outside of USPS delivery range.